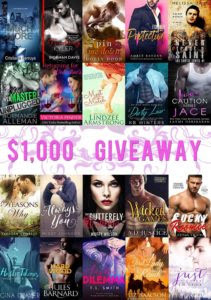 Welcome to the Mega Romance Giveaway! In this giveaway, EVERYONE who enters will win TWENTY-FREE – EXCLUSIVE – ebooks by the sponsoring authors (to be delivered at the conclusion of the giveaway), and one GRAND PRIZE winner will also receive a $1000 Amazon Gift Card! The Winner will be announced on August 15th at our Facebook Event. The winner will also receive an email directly. To ensure a fair drawing, and that the winner is a true fan of the genre, each potential winner will be verified as a true Romance reading fan. We will also post evidence of the prize being sent. Between these measures and the free books every entrant receives, you can enter our giveaway with assurance you aren’t wasting your time! By entering this giveaway, you understand you will be subscribed to the sponsoring authors newsletters and can unsubscribe at any time. You acknowledge that receiving emails from these authors is not spam as your entry is consent to email you.